Brad Pitt rumored to be lowkey dating Charlize Theron for over a month. It appears that a brand new couple exists in Hollywood. And this time, the dating rumors spark from the handsome actor Brad Pitt and his current love interest, actress Charlize Theron. Pitt, 55, previously linked to the finest women in Hollywood including his former wife Jennifer Anniston and Angelina Jolie, once again found another finest woman in Hollywood as his romance partner. As per a new report from The Sun, an intensity between the two stars evolved over a month after being introduced a few years ago by their mutual friend, Sean Penn, who ironically happens to Theron's former fiance. Apparently, media spotted the new couple with each other last weekend at Chateau Marmont after attending film screenings event on 12th January. However, both Pitt and Theron attended different film shows. Pitt went to watch If Beale Street Could Talk show whereas, his partner Theron attended another function showing Roma. Furthermore, as per another revelation, after the screening of If Beale Street Could Talk, Pitt later went to the party where Theron happened to be present. "'Brad came over to Chateau afterwards, changed his outfit and joined Charlize in a corner of the bar." "The new lovebirds were all over each over at a showbiz function last week"
The rumors don't stop there. Upon their romance, Brad and Charlize looked all touchy toward each other with Brad's arm around her back. "At one point he winked at her." Brad's current relationship with Charlize happens to be his first affair after separating from his ex-wife Jolie. Brad and Jolie divorced after ten years of togetherness and two years of being married. 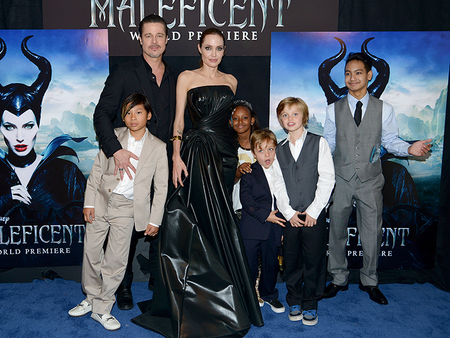 The Fury actor shares six kids with Jolie, 12 years old Shiloh Nouvel Jolie-Pitt, Pax Thien Jolie-Pitt, 13-years old Zahara Marley Jolie-Pitt, 16 years Maddox Chivan Jolie-Pitt, 10 years old Vivienne Marcheline Jolie-Pitt, and 10 years old Knox Jolie-Pitt. During their divorce settlement, Brad admitted the reasons behind their separation mostly included his addiction to drinking. On the other side, Brad's current partner, Charlize previously linked to Sean Penn, Ryan Reynolds, Keanu Reeves, and Alexander Skarsgard is a mother of two kids; August Theron and Jackson Theron, both adopted.